A Life of Sugar and Spice: Rainy days and nasty colds always get me down. Rainy days and nasty colds always get me down. Last week I had nasty sore throat at the beginning of the week. Thursday I started to feel better so I was pumped for my day at P-Town with the ladies on Friday. 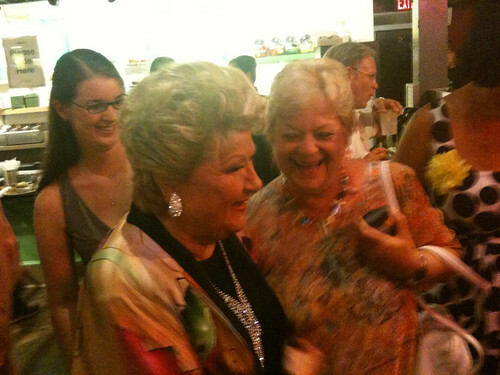 We went down there to see Marilyn Maye who is a phenomenal singer in her 80's!! She's a friend of my aunt's who was in town for a couple of weeks so we decided to take the day and go see her show. (Photo: Marilyn on the left, my aunt on the right, my sister hiding behind them) It was great, but the cold came rearing it's ugly head again and I spent most of the night sniffling and snorting and sneezing... gross. The drive home was two wonderful hours of nose blowing. Not long into the drive I realized that I'd left my bag of clothes and makeup in my aunt's hotel room! Bummer. I stayed at my mom's and waited for them to get back from the Cape with my stuff the next day. Sunday I basically stayed in bed all day. Today I'm back at work, only because I couldn't stand another day of laying around doing nothing. I just got reprimanded by a co-worker for coming in and sharing the wealth. My other co-worker is sitting next to me with the same cold. I think I gave it to my Mom too, my brother, sister and brother-in-law have all had it too. I just hope B doesn't get it because he's traveling this week and that would be miserable for him. He tried to avoid me all weekend! I don't blame him. I did get to see him for a little while but I really do hope he didn't catch it. Having said all that. I haven't run since last Thursday. That was the calm of the storm when my throat didn't hurt but the rest of the cold was just about to begin. That run was brutal, I barely finished it. Today I'm feeling better but it's pouring rain and I'm still not 100%. I think I'll take another night off and try to get back to it tomorrow. I hope this cold goes away soon! !